We all are aware of the health benefits of papaya, but do you know that it has many beauty benefits too? Yes, the enzyme “papain” present in papaya helps in exfoliating dead skin cells gently and naturally, which gives a blemish free and glowing skin. Moreover, it is also enriched with vitamin C, vitamin A, antioxidants, folate, panthothenic acid, potassium, magnesium etc. These help in reducing pigmentation, blemishes, patches and dark complexion. Due to its numerous benefits, papaya is used in many facial kits and today I am going to share top-5 of the best papaya facial kit’s that are popular for their amazing results. If you want clear blemish free and rejuvenated complexion, then do try these kits! 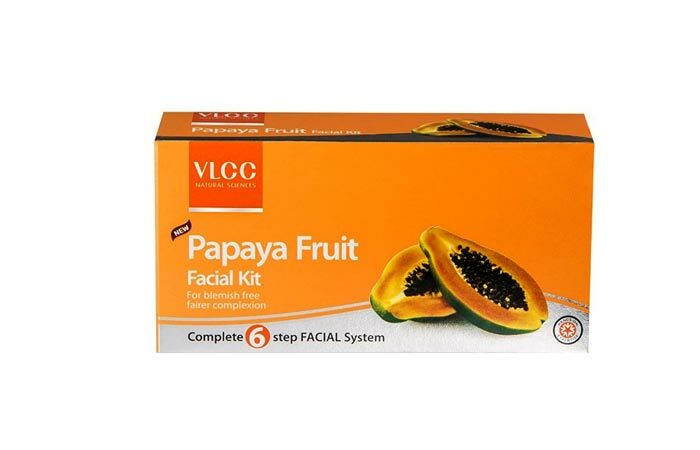 This facial kit is made from papaya and has four sachets in it, which are papaya face scrub, cucumber gel, massage cream, orange anti tan pack and green apple lotion which helps in removing blemishes, gives cooling sensation to skin, tighten facial skin, improves skin tone and reduces pimples respectively. It is suited for all skin types and even people with sensitive skin can use it as it contains all natural ingredients. It will make your skin smooth, soft and the effects will last for long. The sachets can be used 3-4 times individually which makes it cost effective and it’s very cheap when compared with parlor rates. If you have large pores then it will also help in minimizing them and will give you clear and glowing skin. This papaya kit from nature essence is a good way of pampering your skin with the goodness of papaya products. This kit contains a cleansing cream made from papaya and milk which helps in exfoliating dead skin which gives glowing skin. It also contains an exfoliating scrub which helps in scrubbing away dead skin, improves skin tone and also reduces blackheads. Moreover, it also has an anti blemish cream, which removes blemishes, scars, patches and pigmentation. Lastly, the de pigmentation pack is enriched with the goodness of papaya extracts and it works like a natural bleaching agent and gives you fresh, glowing and clear looking skin. Overall, this kit is really value for money and works wonders for skin. 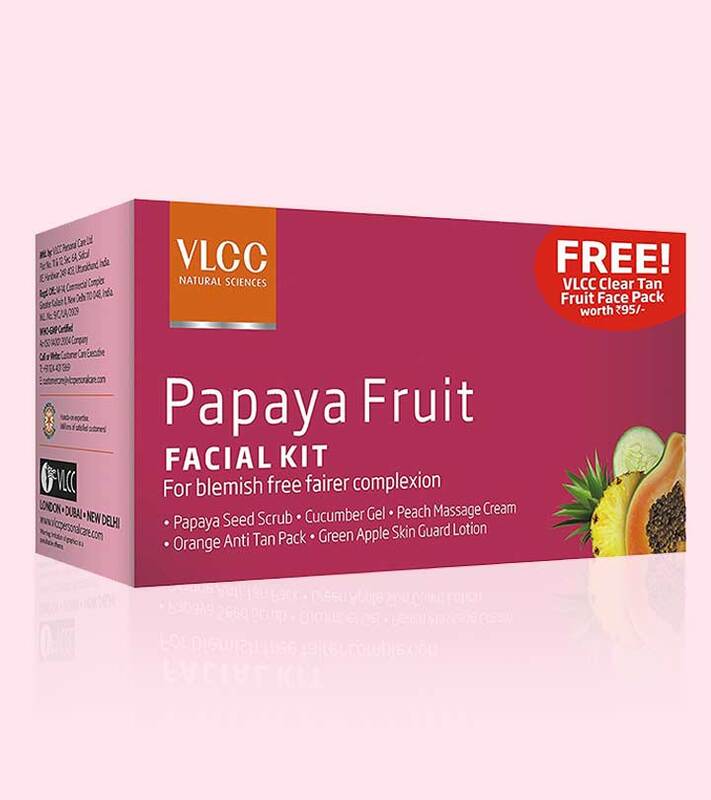 This papaya facial kit from clear face helps in reducing pigmentation and also reduces marks, blemishes and dark patches. It also helps in giving you clear, even and fairer complexion. You will notice the results instantly after using. The facial kit contains 5 items and they are Massage Cream, Scrub, Cleanser, Massage gel and Pack. The items come in tub packaging and they are in huge quantity and you can use the products many times which makes it cost effective and worth the price. It also helps in fading freckles and gives you glowing parlor like facial. The packs come with *directions to use* written on them so that you can use it easily. 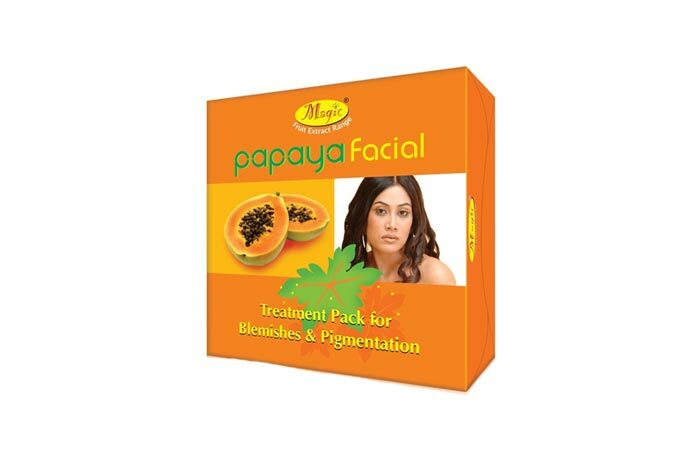 This papaya facial kit contains a papaya scrub, which helps in exfoliating dead skin and gives a glowing skin, also helps in reducing blackheads. After using the scrub you have to use the papaya cream which helps in moisturizing and hydrating your facial skin and gives you smooth skin. Then apply the papaya pack which helps in lightening complexion, even skin tone, reducing acne marks, scars and blemishes and give you clear skin. After the pack apply cleanser which helps in deep cleansing your skin without leaving any residue of dirt behind. After cleansing you need to apply the gel which gives a cooling sensation to your face. The last step is to apply the papaya aroma serum which helps in tightening your skin and it also makes your skin look rejuvenated. One facial kit can be used multiple times and it’s very easy to use also. 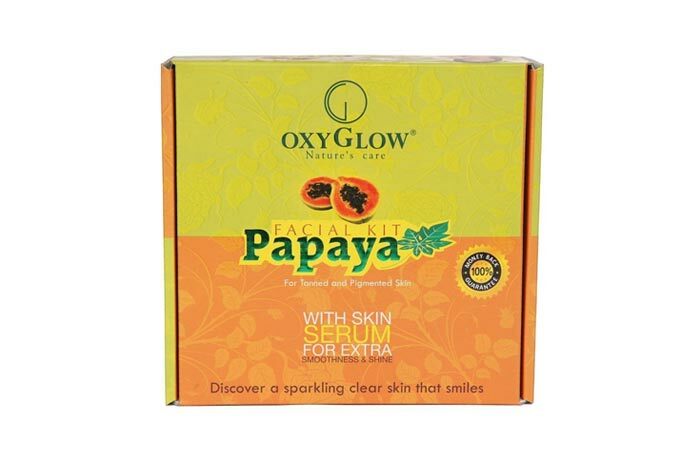 This oxyglow papaya facial kit contains 5 contents in the kit which are face cleanser, scrubbing pack, massaging cream, fairness lotion and Serum. These help in reducing blemishes, acne scars, marks, dark patches and also help in even skin tone. Besides papaya it also contains many other herbal ingredients like honey, saffron, and sandal, fruit enzymes which hydrates skin and also improves its complexion. The price is high but it’s definitely worth the price as it gives you unmatched results. The serum present in it helps in tightening your facial skin and it also helps in maintaining the result for long time. 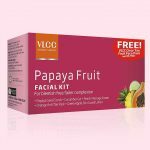 Hope you would find this top 5 list of papaya facial kits useful. Try these facial kits and drop your comments on which one is your favorite. Stay beautiful, stay happy! !